Sale, Porcello, Bogaerts expire 2019 and potentially JDM. Kimbrel, Kelley, Eovaldi contracts already expired, and Mookie is in his second-to-last year. Payroll almost 246M. DD has to be creative. Thanks for summing up the article. Red Sox are a fascinating case-study to follow. Respect they won; that worth bottom ranked farm 30 times over, will just be interesting to see how DD approaches team from long-term view. If the Yanks get another decent starter & modify bullpen, then it should be a better dogfight in the east in ’19. Preach brother. No Machado. Harper all day. Believe bullpen only needs a “tuneup” ;P Chapman is the only LH RP. of course we won’t truly know how it works out until we go to the videotape. Xabial: does DD have any credibility when it comes to a long-term view? I ask this sincerely. He builds winners—often spending massive sums to bring in FA talent— but seems not to sustain that success long-term…. He’s done this everywhere he goes….Miami…Detroit especially. It’s gotta be a pretty good gig. Just like trading baseball cards in the ’60s. He also won a WS in FLA, should have won one in DET and just won a WS in Boston. He’s one of the best in the business. He’s shown this over and over. If you want to gripe that he traded Manny Margot and Moncada, be my guest. This was my fear when he took over. I had faith we would get a ring out of it and we did. But this is not unlike the Cherington ERA when he came in AFTER Theo had leveraged a good chunk of the farm and had a few big contracts to shed. The thing that’s different though is that there’s no Dodgers team this year that’s craving to get back into contention so badly that you could unload a few big contracts as long as you send talent their way. The only way to bring down that number is to let Bogaerts and Sale both walk after 2019, which I find unlikely, because at that point you may as well let J.D. walk as well and consider shopping Mookie for a full season of 2020 and look at a rebuild. I find it much more likely the Sox will spend their way out of this during Dombrowskis contract and then bring in someone who specializes with younger talent as they did with Cherington to try to get things back on track. There’s no Mookie Betts or even JBJ’s that are standing out as likely to help in any big way in 2019 or 2020. Maybe Chavis at some point, but he doesn’t really fit defensively. It’s quite the pickle. They have some young talent that could develop as trade bait to get some more salary control, but that probably will not be the case in the time frame the Sox need it to. For now, I’m getting ready to sit back and enjoy 2019, because 2020 and 2021 leave me with a whole lot of questions and fear, especially with the Yankees on the other end of things sitting where we were in 2015-2016 ready and prepping to strike. I happen to think Bogaerts, Sale, Porcello and JDM are ALL gone after next season. The Sox will take compensatory picks for all of them and move on. I certainly wouldn’t feel comfortable giving Sale $30+M over 7 years. That is for sure. I think we’ve already seen his best. Bogaerts is a Boras guy, so he will be even harder to sign long-term. The Sox have next year to really go for it. After that they clear a lot of dead money and can regroup. They have some good young/cheap assets like Devers, Benintendi & Erod and other guys will emerge over the next couple years. With their resources, they won’t be down long, regardless. You are right to worry about 2020 & 2021, but winning the WS in 2018 will ease the pain quite a bit. They will be just fine long-term. I think we’ve seen that the Sox can be feast or famine at times. We might have a couple lean years coming before the next wave of talent emerges. You can’t be mad when you get a win out of it like Yanks fans like to say about the ARod deal. It’s definitely true. That’s a lot of money to come off the books for sure. Almost $100 million. By the time the Sox rebound even if it’s 2022, Benintendi will be about gone and Devers may or may not be an anchor in the lineup. They are going to have to supplement these guys with 400 innings and a lot of ABs. They will have to spend probably $30-40 million to fill in those minimally with just bodies. At that point, why bother? Under the current CBA there are 2 choices in these situations, go big or go home. Do you really think the Sox extended Cora to strip his team out from under him after 2019? And would he have signed that deal? All fair questions. I just think the Sox spent too much time and money putting this talent and chemistry together to completely tear it down so fast. And like the Angels with Trout, does DD really want to be the guy that traded or let Mookie Betts walk? I don’t think they will tear it all the way down. However, I do think they will get under the luxury tax level in 2020. The way the rules are set up, they basically HAVE to do that anyway. So, it’s a question of how they go about that goal. You can expect that Pedroia, Price, Betts, JBJ, Rusney(and the likes of Wright, Barnes & Erod) represent about $100m of the 2020 payroll. They might have another $15m committed to an Eovaldi or bullpen arms by then, too. It doesn’t leave a ton of wiggle room. It’s tricky. It’s going to be very hard. As you said they will have over $100 mil committed to less than 1/4 of a MLB roster. Even if you fill 30 bodies at an AAV of 3 mil each (essentially nobodies) you’re at $190 mil. Color me impressed if he can pull it off. Cherington wow’d me. Dombrowskis turn. Look at the teams. This is really the first time he is fully in charge. In FL, he was given a mandate to cut payroll. In Detroit he was told to build to win now at all costs. Let’s see what DD does. Westcoast: great synopsis. I though believe Boegarts my return if he has a good but not great season. He was the quiet star this year but due to injuries and possibly fading due to endurance, this was his only superstar season. If he does it again, he likely prices himself out of a Red Sox uniform. How does Cherington wow you? Yes he kept talent but if he didn’t spend on Ramirez, Panda and others, they’d financially be in a different position. I never understood Panda. That said, they’re not the only overspender out there. The biggest obstacle for retaining Bogaerts is Scott Boras. The Sox NEVER work well with him unless they are the only game in town(as the were with Adrian Beltre and JDM). That won’t be the case with Xander, though and Boras will be asking for 10years/$275m(or something else ridiculous by then). I’m not sure you can keep him for anything close to that annually when you have to think about retaining Betts(and Price is already making $30m+). Agree on Betts but Xander is not getting ten years at even $25m. Even if he has another great year, he’s not the best at his position. 5 x $19 – $20m tops if that. What team will pay more? He may have to choose between years and average value. He is young but DiDi will be hitting free agency at the same time and even though he’s presently hurt, with him likely on the market, it presents a lesser cost option. As good as Bogie is, guys in Cleveland and Houston to name just two are better but fortunately for Boston, I think they become free agents later. Regardless, DD will earn his paycheck after next year. I could see Ramirez because the potential of getting some power in the lineup knowing Ortiz was leaving was important. Even though it didn’t work out, Ramirez always had a little pop. Panda on the other hand was just stupid and that’s an understatement. He was only known for hitting in the playoffs and having a couple good years at best. The only reason he was able to get a contract that big is because the three championships in SF were within a tight span. If they only win one championship, he doesn’t get that money.The weight gain and declining numbers should have been a warning sign. You are right on Xander. I am just imagining what Boras will be asking for. Bogaerts will be hitting free agency at 27 and Boras will make him out to be some kind of superstar. I like Bogaerts, but he’s not worth what he will get in the open market. I could see him getting 7-8 years at $20m/year, maybe? I just don’t think it would be the Sox giving him that kind of deal. The Ramirez signing was a C-/D+ move. Panda and Rusney were solid F’s. Between the 3 of them Cherington basically lit $250m on fire. What a disaster. dimitrios: That’s not a particularly fair question. The Marlins don’t exact enable a GM to build a long-term winner; their payroll restrictions force cycles of rebuilds, contention, teardowns, repeat. Detroit, meanwhile, had ownership give a mandate to focus on winning a championship. You can’t really judge the lack of long-term success when that wasn’t the goal he was given. Boston will be a good test for DD, if he stays there. He’s accomplished the goal of a championship, and did it with a core group of young players (and a payroll) that sets up the team to avoid needing an outright rebuild. How well he sustains success for the team and/or reloads the roster over a longer period of time will tell us about his full GM capabilities. Cherington unloaded over $200 million in bad contracts, signed Napoli, Victorino, etc and won the WS the next year. Went down hill from there but that’s a pretty impressive accomplishment. Without Cherington there likely wouldn’t be either of these last 2 WS and it would have been Adrian Gonzalez getting DFA instead of Pablo and Hanley. In hindsight, he did a pretty good job, hence why he’s gotten numerous GM offers. He wants a young team, not an established team already. Yup. Cherington did great initially. Then he went straight downhill. He gave $250m to Hanley, Panda and Rusney. He didn’t draft particularly well, either. He helped win a title in 2013, for sure, but he saddled the Sox with a ton of bad payroll for years to come. He also hasn’t gotten any GM offers as far as I know? He’s tainted. Win it all back to back, then worry. Exactly. Sox have 1 more season with everyone back to go for it all. After that, they will have plenty of payroll space once again. Guys like Bogaerts, Sale, Porcello & JDM are most likely playing their last year for the Sox in 2019. Let’s hope they all shine in a contract year and can go out with a bang. Hopefully convince JD to hang a couple more years to team up with Betts. I can’t really see the Sox going to a rebuild already with the 2nd best player in baseball on the team, a David Price contract that’s not going anywhere, and a core of guys that have proven to love playing both together and for the manager who by the way is now locked up for awhile. I think people misunderstood John Henry and it wouldnt surprise me to see him clarify it, but I think his comments in regards to not staying at this level forever doesn’t mean they are done in 2020. I think he meant what he said. Don’t expect a $200 million payroll every year. But there’s no saying they can’t get a deal done with Bogaerts and Martinez to keep the offense around. They probably should avoid committing huge money to Sale and Porcello, while effective, is too inconsistent for them to give him another $20 mil a year or anything close. But I’d be shocked to see the Sox let everyone walk and go the rebuild route. Dombrowskis is the guy that signs the best players in baseball. Not often the one to let them go. Henry made his bed and he knows he needs to lie in it. They didn’t get Red Sox Nation this fired up and commit all this money to let the fire die down and the Pats Bruins and Celtics take back over. Losing isn’t an option in Boston right now. There are other teams in the area willing to compete. They need to oversee the delicate balance between going for it while thinking long-term at the same time. I could see them trading one of those expiring contracts next season if it gets them some prospects back. Would they flip Sale or Bogaerts at the deadline rather than risk losing them for a 4th round compensation pick, for example? It’s tricky! Not if you want to win a world series in 2019. However if the Yanks look unbeatable around the deadline you have to consider it. The Red Sox 2020 plans actually hang a ton on the Yankees off-season. If the Yanks leave even a little hole like they did with the rotation this year, you gotta try to get another win. But if you’re back 5-6 at the deadline and really competing for a wild card? Yeah I think it might be a rare situation where an early fire sale could reap huge benefits from a team like the Astros looking to add a Justin Verlander (Chris Sale). But man, you gotta be ready for the backfire from the fans… That’s a tough sell unless you’re 12-15 out. Yeah, I am thinking of what the Yankees did a few years back when they moved Miller and Chapman at the deadline for a bunch of prospects. It was pretty brilliant. 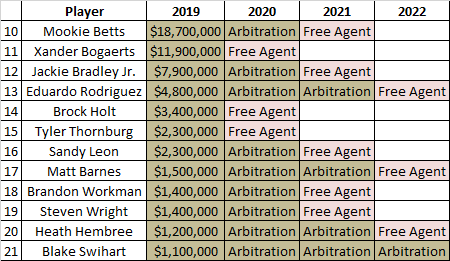 It’s definitely a tough sell, but when I think of losing Bogaerts and Sale for a couple 4th round compensation picks, that hurts them much more long-term. If things aren’t breaking their way next season, they have to at least give it some thought. Bogaerts is “likely” playing his last year in Boston? He certainly might move on, but I’d put the odds at much higher that he STAYS, not leaves. Agreed! I’d rarely let a player walk via FA rather then trade him. If you make a deal you have choices. If you get a compensation round pick, it’s a complete coinflip for the most part. The hard sell here is that Bogaerts is going to be pitched as if Correa hit the market and I don’t think his upside is nearly as high as Correa or Lindor. If he runs into a brick wall and has to settle for a less then premier deal he will probably opt to stay where he is. But the Sox can’t afford to shell out $100+ mil with the other pending free agents over the next 2 years. It will come down to who DD values as the core of the next team. Not with Boras as his agent. The Sox almost NEVER work well with him. And they won’t pay top dollar for Xander anyway(and, frankly, he hasn’t shown much to prove that he’s worthy of top dollar). @Mets: Yanks will challenge them this year. I hope they do. Except for winning the division by a lot, it wasn’t thrilling. Esp seeing two teams over 100 wins. Now if only the Mets would return to their mid/late ’80s form I could enjoy the trifecta of baseball. I think people are too hard on you, but you clearly came here to post without even reading the article. Why? Trying to bait the trolls? I wonder if that’s a word yet on urbandictionary.com?? WWWhatt? What kind stuff you smoking. Why say 246m, why not say 700m since your making sh*t up. Don’t forget the $18m they owe Panda next year…..
That’s the first time I’ve ever heard someone say that a contract “expired” for a team…that acquired said player as an in-season rental (Eovaldi). Having an in-season rental expire does not factor in to the decisions a team has to make; that was a given from the moment the player joined the team. I’d take the over, signing Eovaldi for something like $15M/year for 3 or 4 years and one reliever not named Kimbrel who could compete with Barnes and Brasier for the 8th and 9th innings. That would leave them in the high $230s and some room for a late July pickup or two without going over the $246M mark. Yep, DD will have to be creative……. Yep, they have to bump up against the Tax…..
Yep, they’ll get it done. They have a commitment to winning that strips other teams. Doesn’t mean they WILL win; the game’s too accidental. But they’ll be trying. Does Pablo’s salary count against the cap seeing how he is not on the Red Sox 40-man roster like Castillo? The loophole of outrighting players to circumvent the tax was closed in the new CBA. But even if the loophole was still open, it wouldn’t have applied to Sandoval. But yes it counts is the answer. 1. The Castillo signing might in my opinion be one of the worst in major league history. Maybe not in total dollars, but just the sheer fact that is was a full $72.5M wasted (was it slightly more actually – wasn’t there a fee in addition?). Not even from day 1 did it make sense. The guy never played baseball in his life (he didn’t although he pretended too). The Sandoval signing does rival for worst ever. Most of these awful signing were limited to a window of between 2010 and 2015. The Red Sox had something very weird going in their FO during that time period and one day, I would love to read a full article about the dysfunction over those years. I mean come on, Bobby Valentine? It is peculiar that the Red Sox hold maybe the top 5 worst signings ever. And I’m not just spitballing that either. But that’s a conversation for another day. 2. I predicted early on that Machado would wind up with the Red Sox and I’m still convinced that could happen. We’ll see, but it makes a lot sense for a variety of reasons. 1) That’s why they fired Cherington. 2) no way the Red Sox Machado. 0% chance. Sox go for high-quality character guys most of the time. They have a good Clubhouse. Don’t talk about Manny Ramirez they signed him in 2001. I’m speaking about this regime. I don’t think the Yankees sign Machado either. He’s more like a Phillies Orioles Mets Cardinals Giants guy…. maybe Dodgers. 1) Cherrington was the fall-guy for Lucchino’s shenanigans during that period. Cherrington was let go even though he did manage to hold onto a lot of top Sox prospects and Luchinno got a golden parachute and was banished to Pawtucket. 2) Agree. Don’t see the Red Sox signing Machado because that would require Dombrowski to get more creative than just opening an owner’s checkbook. However, I do see Cashman getting creative once again and swooping in at the last min to sign Machado. Lucchino was always made out to be some kind of boogeyman who took the blame for everything that went wrong. Let’s be honest here: Cherington was absolutely awful. He got it all right in 2013 and then his luck ran out immediately after that. Hanley, Panda and Castillo were all horrendous moves that bloated the payroll for years to come. I’m not blaming Luchhino for any of those failures. The one where we probably CAN blame Luchhino a bit is the lowball offer to Lester. That was another huge failure and Cherinton’s hands were basically tied on that one. Don’t get me wrong…loved Lester. But the chicken/beer escapades with Lackey too reminiscent of the Bonilla/Henderson card game DURING game 6 of the ’99 NLCS. Send people packing even if you low ball them. Luchhino has always had strong ties to the Marketing/PR depts in all the FO’s he worked, so when the ratings at NESN we’re down and surveys were circulated around the FO, he was the one who wanted to bring in the gimmicky Panda to get more women and kids to watch the Sox. Rusney Castillo has been very good two years in a row in AAA. He’s old for the level, obviously, but he would be on a major-league team were it not for the contract. Did you forget about Pavano? Scaled to today’s standards he was pretty bad. Kei Igawa was awful. Even Alex Rodriguez’s last contract can go in that bunch considering he missed a ton of time between injuries and such. Then there’s Ryan Howard. Mike Hampton. Vernon Wells. David Wright. There’s a lot of bad contracts all around baseball. The biggest spenders tend to have the worst contracts. That’s just common sense. Miguel Cabrera probably has the worst contract in MLB at this point. The Tigers owe him 5 more years at $162m and he’s already washed-up! Pujols’s contract is awful, too, of course. That one was doomed from the beginning. Rusney and Panda are uniquely awful contracts, though. Rusney because they have to keep him in AAA no matter what he does and Panda because he was cut after 1 season. It’s hard to do much worse than those 2 moves. That’s not a conversation for another day. If you think Boston has “maybe the top 5 worst signings ever”, your bias is showing, period, end of story. These articles are interesting but it doesn’t mean much unless you understand what the teams gross revenue is for the prior-year and projected for upcoming years. I would estimate that team payrolls (including front office) are about 50% of the clubs gross revenue…give or taken some percentage points. …and a final payroll of $224M..so, roughly 32% …but they are generally the exception, not the rule and that’s also why they pay millions in revenue sharing. I’m guessing most teams in markets like Boston, Chicago, LA, Houston, and others probably have team payrolls around 50% of gross revenue. That said, a teams decision to sign a high dollar free agent may have more to do with overall gross revenue than with team payrolls. That aspect is not covered in this article. If you’re using actual cash instead of AAV to estimate the 2019 payroll, then that’s not the “luxury tax payroll”. Cot’s baseball uses AAV (which is correct), and puts their 2019 CBT payroll at $224.5M. They also estimate $4.5M higher arbitration costs than you. That part is debatable, but even if we use your arb estimates instead of theirs, the CBT payroll is $220M right now. $10M is not enough to do anything impactful with this winter. If they intend to cap themselves at $320M, then their best bet is to take that $10M, and place it under the biggest matress they own, until the summer. In the summer, $10M goes a long way, because you only have to pay 2 months’ salary. You can get the best closer on the market, plus a decent position player, to cover a potential injury. To your point, yes and many on here have discussed this already. The Red Sox are at a major crossroads having just won a great WS. They have zero roster flexibility, a tremendous amount of financial obligations and I don’t think they even have $10M to spend. I mean they can spend whatever they want, but it wouldn’t be prudent. Like I said a couple weeks ago, they would be justified retooling a bit themselves. Might be a hard sell following a WS win, but it is what would be best for the team long-term. Retool? Are you kidding me? They just won the World Series and have practically everyone back. That’s not how you play with the big boys. Yes you manager payroll but you let a guy like Kimbrel walk. Retool LOL. The Giants should retool. The Mets should retool. Any team Dombrowski is attached to it is gonna have a super high payroll. Any team Dombrowski is attached to it is gonna have a super high winning percentage. Not going to repeat, it’s the Yankees beginning of yet another dynasty in the making. The Yankees are admittedly always very very good. You don’t see them ever finishing last place two of the last 6 years. I hate it there always awesome. I respected Joe Girardi quite a bit, but I understand 10 years run or whatever he did as a manager is all you can ask for. Then you got to change. Fortunately my Sox have been pretty good the last couple years and I hope they stay that way. Three straight division titles not too shabby . But yeah the Yankees are right there every time. Every time. For me as I’ve commented previously I like the competition between the Yanks and Sox. I am holding out hope that the Phillies can do the same things vs the Bravos and Mets. Matt Klentak does not inspire confidence in the phans. They have all those accomplishments the last 2 years of this dynasty. Division titles, pennants and World Series. Amazing run. Did you copy and paste that comment from last winter when Boston wouldn’t repeat as AL East champs? Sadly, there is little chance of repeat, and less chance of retaining the core in the near future. We were a long ball away from going to a decisive gm 5 against the Yankees and a possible disappointing fall…..just so close. But we won, so savor it. Mookie should be offered a long-term deal, JBJ is awesome defensively but his bat has been disappointing. I’d like to see improvement behind the plate instead of rotating the 3-headed monster, get a stable, steady catcher. 2nd is a long-term concern, even if Pedroia does return…how much longer? Is he a bad slide at 2nd away from his career ending? We need to look at the rebuilding the farm too, we could overtax our resources if we lose too many players. This is a huge year for Devers, sink or swim! Brasier has the stuff to be a closer if Kimbrel is too costly. Very thorough Rob. If the Sox find a taker for Castillo but have to pay down some of the cost, will that cost then count assuming he’s on the 40 man roster of that team? My biggest gripe with the story is Vasquez whose cost is not that substantial and he provided key ABs during the WS. The defense he and Leon have provided splitting time is worth the cost to me given the rest of the lineup. This would be a bigger issue if there was no DH. Agree. I think 2019 will be closer to 2017 for Vazquez and thatll be fine with me. Hitting .250+ with enough bat control to hit and run and play plus defense seems like a better than average catcher in today’s game. Hope they do keep all 3 catchers. Swiharts flexibility makes it work and if he got more regular at bats i think he could break out offensively. The Red Sox have a lot of resources but they are limited. One of the problems that the Red Sox have is so many really good young core players hitting free agency within a year or two of each other. They will not be able to keep them all. DD lives and breathes this stuff and I trust he will figure it out and the Red Sox will remain competitive even after this year. DD got a bad rap in Detroit for burying the team in bad contracts but that was due to an aging owner that wanted to win the World Series before dying. He also was forced to trade his entire World Series team due to an owner in Florida. He won’t have that problem in Boston as long current ownership is there. Now we will see what he does when he isn’t constrained by an owner to the extent he was before. I may be wrong but I like the Red Sox chances with DD at the helm with current ownership for years to come. When you have Moreland, Pearce and JD, there is no place for Votto. Besides, he’s a head case anyway. Everyone is worried about Betts. He’s a great player who lives on bat speed. Once he loses that he’ll just be a fast guy, which there are plenty of. His pop is solely on his ability to drive the bat through the zone at a high velocity. I love the guy, but I don’t see him as being a long time great. He’ll fade in like 5 years. DD needs to figure out who will be our ‘core group’ going forward. Bogaerts, Benintendi, Betts, Martinez and Bradley will vary significantly in cost but should make up the core on the hitting side. Get the extensions done asap if possible.if not, determine who is expendable/replaceable for the amount you are willing to pay at the position. On the pitching side, Sale is the only guy that belongs in the core group. Eovaldi is interesting because another year of what he did this year and he would qualify to be a core guy too if we can get him back. That means set aside / plan for Betts at 35 to 40, JD at 30 or so, Bogey at 20 to 25, Benintendi at 20 to 25, and Bradley at 10 to 12. That totals $115 to $132. Plus Sale at $30 (if he really wants to stay). He’s not a greedy guy. So 145 to 162 plus Devers if he proves he can field, then add a 1B, 2B and catcher. Pearce and Moreland, an aging 2B who can still play like Peddy or Kinsler, EROD, and a bunch of hard throwing cheap relievers. That just leaves a closer and a 4/5 starter. Maybe by then some of our young guys in A ball will be ready to fill out the back half of the staff. The future isn’t going to be cut short by all the Bs getting big paydays. It just means our chances of going under the luxury tax are slim to none. I agree. 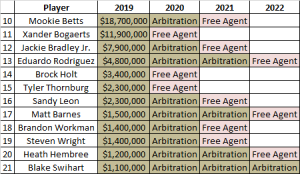 Give the money to #1 Betts, #2 Benintendi, #3 Bogaerts (if Boras doesnt screw things up), #4 Bradley who shouldnt ever top $10M/yr unless he gets a consistent bat. Devers should step up and be the next big extension. Chavis or Dalbec beyond that. Starting pitching is overpaid today for what they give. Better off with 5 guys who can give you 6 solid innings at decent value since aces are almost nonexistent today. I wouldnt overpay for a starter or closer today. Skipping those contracts but signing the core they should means payroll drops and they are good for years.